Just as a reminder if you did not read the first blog post Munsell and the Color of Flesh, flesh comprises a specific area of the Munsell hue circle. Average flesh for the vast majority of human being ranges between 2.5 YR to 7.5YR with chromas between 2 and 4. If perceived as a local, that is the hue and chroma considered without the effects of shadow or strong light, the value of skin starts at 2 and ends around 7. People are usually not as dark or light as they seem. Values 3 to 6 are most common. The trick to painting realistic flesh is to paint within this gamut. Of course, temperaments vary considerably, and who are enthralled by art and design may not be enamored with precision. Still, it is nice to have the knowledge when creativity demands. This will mean learning to neutralize higher chroma colorants or finding the correct one to raise the chroma. 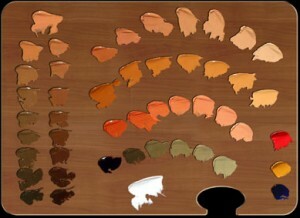 Luckily, a flesh palette can be made of many different pigments in many combinations. So what colors are the best to start with? Advice: it is always better to begin the most obvious.One of the benefits of living today is the great diversity of pigments available. In order to parse the useful from the exotic, find colorants that are already red, yellow-red or yellow and low in chroma. These could be natural pigments dug from the ground or synthetic variants. If the former these will be the ochres, umbers and siennas; the later may be called oxides or Mars colors. Add black and white, and you have a convenient basis for creating a fleshly palette. The only extra pigment will be a red. Find one close to your desired hue, value and chroma as well. Some people, by contrast, are more inclined to try more difficult combinations. Difficult is said, because higher chroma will require, a lot of neutralization. This can be achieved by adding a neutral directly composed of black and white or it can be achieved by mixing in hues that are opposite or near opposite to the gamut of flesh. For example, instead of using black, try ultramarine blue. Instead of yellow ochre, use cadmium yellow. Add cadmium red and white and you will cover the range, including the ruddy areas of the figure such as hands, feet, nose, cheeks and ears. However, when mixed properly, these colors will be indistinguishable from the earth colors mentioned above. 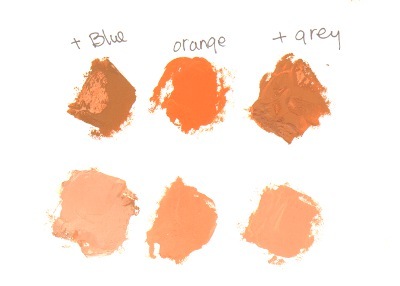 In the next article will cover strategies on how to arrange your palette, Munsell style.